One of the most important skills you can learn in life is knowing when to quit. Unfortunately, this skill is rarely taught in schools of any type, and there are not many books on the subject, either. So, grab a sit and get ready. This is your education on quitting. A few years ago, a few friends and I were thinking of starting a coffee shop in our neighborhood. We live in an urban neighborhood, and many similar communities in Nashville have some sort of java shop. It seemed to be a gaping hole in our growing neighborhood, so three of us got together and began to do our research in pursuit of this caffeinated dream. We did the math, looked at real estate, interviewed those who had done similar things in other places, and began to plant the seeds of our new venture. But, about three months later, we pulled the plug. I'm glad we did. Not because we couldn't have been successful, but rather because it was a better decision personally (and for each of us, collectively) to stop the pursuit at that point and move on to other things. Know when to quit. Set a goal, a benchmark, a standard. And make sure everyone involved understands that if you don't hit that mark on time, then it's time to pack up, call it a day, and learn from your failure. Otherwise, you run the risk of continually walking down the path to nowhere, and you'll waste time, money and energy that could have been placed somewhere better. Our world is full of examples of those who didn't know when to quit. They carried on – all the way to oblivion. 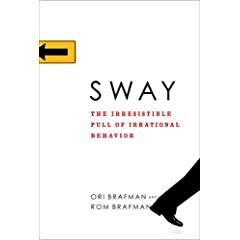 This is highlighted very clearly in the first chapter of Ori Brafman's and Rom Brafman's new book, Sway: The Irrisisitable Pull of Irrational Behavior. They introduce the book's theme by sharing the story of an airline pilot who was responsible for the worst aviation disaster in history and of a regular Joe who never sold his stock at the right time and eventually had nothing. In each case, the individual perceived that the overall loss meant more than the immediate situation. The airline pilot took off in fog, without clearance, causing his full plane to crash with another full plane, resulting in the deaths of over 500 people. He took these drastic steps because he didn't want to face the alternative, which would have had him (and the entire plane) staying overnight because he would have been flying longer than the allowable shift time for a pilot. In other words, he ignored the air traffic control tower in order to save time and money. In reality, the airline's cost for housing all of the passengers and the inconvenience of the delay are clearly better than the reality that ensued. The same thing happens with a guy who sells his company and is paid in the stock of the acquiring corporation. His financial adviser tells him to set a schedule so that he sells 10% of the stock each quarter until his portfolio is nicely diversified. No matter what the worth of that stock is, it's best to sell it so that all the eggs aren't in one basket. Three months later, the stock's value has fallen 15%. But instead of selling on schedule, or dumping all of it, the guy keeps it, waiting until it goes back up to its previous value. He's afraid of the loss he'll take by selling it at the moment. Of course, the stock never reaches its previous high and the guy rides the downward spiral until he's got nothing and the company goes under. He held on because he was afraid the cost of quitting was too high. This happens a lot with political candidates. They don't know when to exit a race and do more harm than good – or at least they miss the chance to do more good than harm. It happens with people in certain careers. Take a look at Michael Jordan. He's still the greatest basketball player ever, but his final years as a Washington Wizard are an ugly hiccup on a great career. It happens with musical artists and actors who put out a few duds of a project just because they can't gracefully exit the stage. Would you know when it's time to quit? When it's time to change jobs, having learned everything where you currently are? When it's time to admit your business idea didn't quite work and you'd be better off working for someone else? When your dreams of flipping a house didn't come true and you'd be better to unload the property, even if you lose a bit of cash? We don't like talking about quitting a lot. It's not as glamorous as winning, and no one is remembered because they're a good quitter. We value the stories of the people whose backs were against the wall – those who didn't quit and came out better than ever. Those people certainly deserve praise and accolades for doing a great thing and being successful. But being a smart quitter is as equally as important as knowing when to press on. Knowing that I need to fold my pair of tens with an ace kicker because a possible flush is on the board, even though I'm in for a quarter of my chip stack – well that's as equally a good decision as calling the bluff and going all in. Ultimately, you've got to be able to read the signs. And we'll do our best if we heed the professor's advice and set our limits before we even sit down to play. Another helpful tool is to find that person who will tell you when it's time to quit – someone you trust and admire. For an example of that, read my mom's post about Big Brown.